To me, summer means sunshine, farmers’ markets and grilling. I personally love the flavors of grilled foods and regularly grill veggies as a side or base for meals. One of the greatest challenges I have faced in my years of counseling and teaching is that people have been trained to think they don’t like fruit and/or vegetables, and they don’t venture outside the norm for ingredients or culinary techniques. The remedy is simply to get a little creative in the kitchen – or backyard – and be okay with failing once in a while. I base most of my meals on produce, and in the summer that means adding a treat of grilled fruit at the end! Grilling is probably one of the simplest culinary techniques for fruit and veggies. In the beginning, it’s a good idea to stay close to the grill to keep an eye on your food; err on the side of slightly lower heat so it doesn’t burn, then turn up the heat at the end for beautiful grill marks. Grilling infuses fruit with smoky and savory flavors and causes caramelization of sugars, leading to more color and flavor changes. It’s a whole new way to experience fruit! In my food science lab, we talk about how sugars in fruit, when exposed to high temperatures, start to melt: The sugars are inverted and water is released, resulting in sugar molecules rearranging and binding together to form chains. Organic acids and other flavor compounds also accrue, resulting in different flavors than the original sugars. Basically, the compounds are altered so we sense a unique flavor on our taste receptors. * Science is fun! My favorite treat is to slice pears in half, set them on the top rack to soften, then pop it onto the heat for a bit at the end. I serve them drizzled with honey or chocolate sauce, then sprinkle with walnuts or a dollop of whipped cream. Delicious and a pretty presentation! Want more ideas? 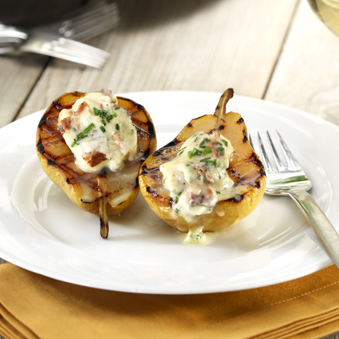 Check out a few of my favorite grilled pear recipes, including grilled pears stuffed with mascarpone and bacon, at USA Pears. *McWiliams, Margaret. (2012). Foods Experimental Perspectives. New Jersey: Prentice Hall. 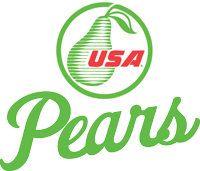 This entry was posted in Food and Drink Recipes, Nutrition and tagged Amy, Anjou, fruit, grilling, health, Nutrition, pear recipes, pears, summer by Amy Kweller MS, RD. Bookmark the permalink.